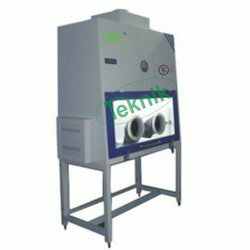 We have grown as a reputed manufacturer & exporter of Air Curtains, Air Showers, Fume Hoods, Laminar Air Flow Cabinets- Vertical, Laminar Air Flow Cabinets- Horizontal, Portable Tissue Culture Rack, Bio Safe Biological Safety Cabinet, Garment Storage Cabinet, Sterile Material Storage Cabinet, Tissue Culture Hood, Inoculation Hood, Dehumidifiers etc. 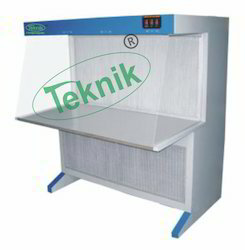 Maximum working area in Laminar Flow Cabinet. Handling of ocytes and embryos on one level. All ocytes from one patient in one storage tray. Ocytes stored in cabinet until insemination. Cleaning is easy and sterilization possible. Laminar with All Stainless steel body / Sealing / Wall Hanging can also be fabricated. Suitable for Pharmaceutical Industries as per the requirement. 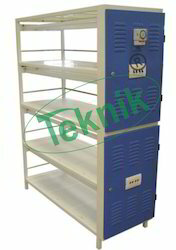 Each shelves has been provided with four fluorescent tubes of4’ size. Are designed to provide protection from biological & particulate contamination in high traffic areas and entrances of clean air laboratories or rooms. Outer made of thick CRC sheet duly powder coated. Dynamically balanced blowers with minimum vibration and noise level draw the air and blow it through high efficiency Hepa filters accurate down to0.3 microns with efficiency of 99.97% bacteria free area. 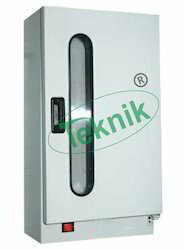 Automatic actuating air-shower operation, adjustable time-duration of air-showers, recirculation of uncontaminated air, adjustable air-nozzles, clear acrylic door, solid state control system, provision of fluorescent tube lighting are the main technical features. 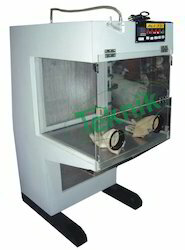 Laminar Air Flow Cabinets works on laminar flow principle involves double filtration of air through coarse Pre Filters (upto"5"microns) and Hepa filters (down to"0.3"microns) for filtration of Biological & Particulate contaminants. A constant uni-directional air flows either Horizontally or Vertically, is drawn from atmosphere and passed through pre and Hepa filters on to the work surface. Fabricated out of reinforced pest and weather resistant Duro-board which is clad in from outside in laminated sheet and inner exposed areas are finished in Epoxy paint. Table top stainless steel sheet. Side panels are fixed and made of clear plexiglass. Front door is folding & made of clear plexiglass. DOP tested as per Standard BS:"2831"with efficiency"90%"down to"5microns. Made of Washable synthetic material. Made of Microglass fibre with corrugated aluminium foil separators. DOP tested as per US Standard"209B. "Efficiency"99.97%"down to0.3"microns. Assembly of AU or equivalent motor workable on"220V"AC"50Hzsingle phase, dynamically balanced blowers making the unit least vibrant with minimum noise level. Sterilization": Germicidal Ultra Violet (UV) tube. Manometer": Static pressure thick Acrylic block type. 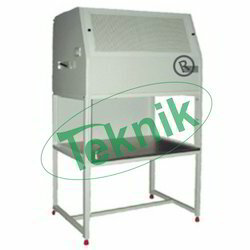 ‘Class 100’ Laminar Air Flow BIOSAFE Biological Safety Cabinet complies with the guidelines laid down by U.S. National Institute of Health, and the specifications of British Standard 5726 — Appendix A for class II Biological Safety Cabinets." Available in following sizes :- Work area 4' x 2' x 2' and 6’ x 2’ x 2'. 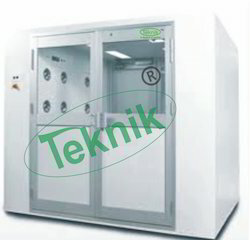 Bio Safe Biological Safety Cabinet : These Class I safety cabinet provide protection for the operator and the environment, with inward airflow away from the operator. Air is filtered before release to the atmosphere. Supplied complete as above, with cord and plug, suitable to work on220V single phase, 50Hz, AC supply. Available in following sizes :- Work area 4' x 2' x 2' , 6' x 2' x 2'. 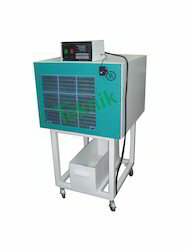 is a self standing providing down flow clean air to clean room Garments. Recommended in change rooms. 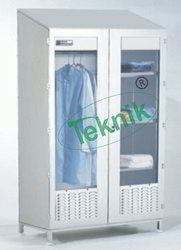 Suitable for Pharmaceutical, Hospital and O/T, Electronic Industry etc. Supplied complete with Hepa & Pre filter, Motor Blower. Static Pressure Manometer & Built in U.V. Germicidal Light. Optional Accessories: Exhaust Ducting per running feet. Note: Supplied with Pre filters. 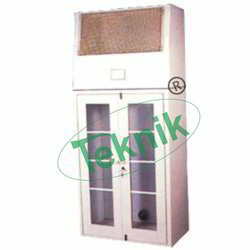 (Vertical Flow) is a self standing, down flow clean air cabinet for use in clean rooms for storage of materials. Suitable for Pharmaceuticals, Hospitals and O/T, Electronic Industry etc. Supplied complete with HEPA & Pre-filter, Motor Blower, Shelves. Static Pressure Manometer & Built in U.V. Germicidal Light. are designed to remove excess moisture from atmosphere when manufacturing activities of tablets, capsules and air accuracy is required. Humidity can be brought down to 30% RH with accuracy of ±3% RH. 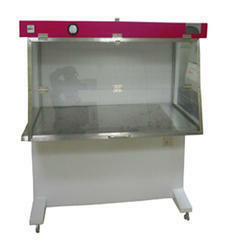 The ultraviolet chamber, we deal in is recommended for its various utility in all kinds of hospitals and laboratories. These chambers are scientifically developed and designed by our highly skillful engineers as per the international standard and norms. They are accessible in high strength stainless steel body. In addition to this our stainless steel UV chamber is backed with all modern and sophisticated features for maintaining the sterility of sterilized instruments in dental clinics. We not only offer this chamber in customized order demanded by our clients but also at the most reasonable rates as against the general market. Apart from that we are reckoned as one of the most famous U.V. chamber manufacturers from India. Looking for Clean Air Systems ?